USES: This medication is used to increase your appetite and to prevent or reverse significant weight loss (e.g., muscle wasting in cancer or AIDS). By preventing weight loss from disease, you will feel better and may be able to be more active. This medication may also be used to treat cancer of the breast or uterus. It may be used alone or with other treatments, including surgery and radiation, to stop the growth of your tumor. 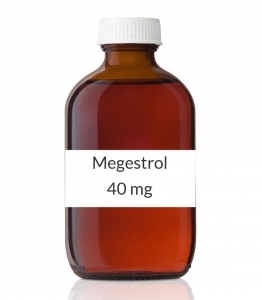 Megestrol is similar to a natural substance made by the body called progesterone. It is not known how megestrol helps appetite or stops tumor growth. OTHER USES: This section contains uses of this drug that are not listed in the approved professional labeling for the drug but that may be prescribed by your health care professional. Use this drug for a condition that is listed in this section only if it has been so prescribed by your health care professional. This medication may also be used to treat cancer of the ovaries. HOW TO USE: Take this medication by mouth, exactly as prescribed by your doctor. Shake well before measuring the dose each time you take this medication. Do not switch between different forms of megestrol because they may not have the same amount of medication. Your dosage is based on your medical condition and response to therapy. Use this medication regularly in order to get the most benefit from it. To help you remember, take it at the same times each day. It may take several weeks of continued use to see a benefit. Inform your doctor if your condition does not improve or if it worsens. SIDE EFFECTS: This medication can cause weight gain, changes in appetite, stomach upset, diarrhea, gas, trouble sleeping, decreased sexual ability/desire, or fever. Women may experience changes in their menstrual periods, including unpredictable bleeding. If any of these effects persist or worsen, inform your doctor promptly. Remember that your doctor has prescribed this medication because he or she has judged that the benefit to you is greater than the risk of side effects. Many people using this medication do not have serious side effects. Tell your doctor immediately if any of these rare but serious side effects occur: fast/pounding heartbeat, headache, swelling of hands/feet, fatigue. Seek immediate medical attention if any of these rare but very serious side effects occur: chest pain, confusion, mental/mood changes, weakness/numbness on one side of the body, pain/redness/swelling of arms or legs, slurred speech, trouble breathing, severe or sudden vision changes. A very serious allergic reaction to this drug is unlikely, but seek immediate medical attention if it occurs. Symptoms of a serious allergic reaction include: rash, itching/swelling (especially of the face/tongue/throat), severe dizziness, trouble breathing. This is not a complete list of possible side effects. If you notice other effects not listed above, contact your doctor or pharmacist. In the US - Call your doctor for medical advice about side effects. You may report side effects to FDA at 1-800-FDA-1088. In Canada - Call your doctor for medical advice about side effects. You may report side effects to Health Canada at 1-866-234-2345. PRECAUTIONS: Before taking megestrol, tell your doctor or pharmacist if you are allergic to it or if you have any other allergies. This product may contain inactive ingredients, which can cause allergic reactions or other problems. Talk to your pharmacist for more details. Before using this medication, tell your doctor or pharmacist your medical history, especially of: adrenal gland problems (e.g., Cushing's syndrome), blood clots, congestive heart failure, diabetes, high blood pressure, kidney problems, unusual vaginal bleeding. High blood sugar (hyperglycemia) and worsening of diabetes may occur. Symptoms of high blood sugar include thirst, increased urination, confusion, drowsiness, flushing, rapid breathing, or fruity breath odor. If these symptoms occur, tell your doctor immediately. People with diabetes should monitor their blood sugar levels more frequently when they start taking this medication and whenever the dose changes since they may need to change their doses of diabetic medications. This drug may decrease adrenal gland activity. Make sure you tell your doctors and dentists of your megestrol use and when you stopped using it. After stopping this drug, additional corticosteroids (e.g., prednisone or hydrocortisone) may be necessary in stressful situations such as trauma, major surgery or serious infection. Consult your doctor or pharmacist for details. Symptoms of adrenal problems include unusual weakness, dizziness, nausea and rapid weight loss. Kidney function declines as you grow older. This medication is removed by the kidneys. Therefore, elderly people may be more sensitive to this drug and to its side effects. This medication must not be used during pregnancy. Megestrol may cause harm to your unborn baby. If you become pregnant or think you may be pregnant, inform your doctor immediately. Women of child-bearing age should use an effective form of birth control while using this medication. Consult your doctor for more details. It is unknown if this drug passes into breast milk. Breast-feeding while using this drug is not recommended. Consult your doctor before breast-feeding. DRUG INTERACTIONS: Drug interactions may change how your medications work or increase your risk for serious side effects. This document does not contain all possible drug interactions. Keep a list of all the products you use (including prescription/nonprescription drugs and herbal products) and share it with your doctor and pharmacist. Do not start, stop, or change the dosage of any medicines without your doctor's approval. Some products that may interact with this drug include: dofetilide, indinavir. NOTES: Do not share this medication with others. Make sure you see your doctor regularly to see how well the medication is working and to check for any side effects, including high blood pressure or high blood sugar levels.